It’s a non-stop family party, and there’s no washing up to do afterwards, reports John Honeywell. During my career on national newspapers, there was only one year when I was able to take a proper family holiday at Christmas – and that was prompted by my son spending 12 months studying at the University of Miami. A week in Orlando and a week on Florida’s Gulf coast? Most acceptable, thank you very much. Every other year, and especially since Boxing Day publication was brought in during the 1990s, I had to be around to work my shifts – otherwise an unfortunate few might have found themselves working Christmas AND New Year. By last Christmas I had a little more freedom, and it was time to splurge. The opportunity to spend the festive season far away from the supermarket crowds and caterwauling carol singers was irresistible. As was the thought of having Christmas dinner prepared for us rather than having to spend hours in the kitchen, up to my elbows stuffing Paxo into a turkey. My wife also welcomed the prospect of not having to follow in my wake, washing sinkfuls of pots, pans and glasses. She was a little apprehensive about leaving our other son behind because he could not get the time off work. He was going to be Home Alone, and relished the prospect of not having to fight for the TV remote. He even posted a Tweet on Christmas morning, celebrating the peaceful start to his day, and followed up with a picture of his own Christmas dinner – a microwaved macaroni cheese accompanied by a bottle of Rioja! Son Number two’s partner has already given her evocative account of our Christmas cruise – or Cruisemas, as she dubbed it – on the preceding pages. 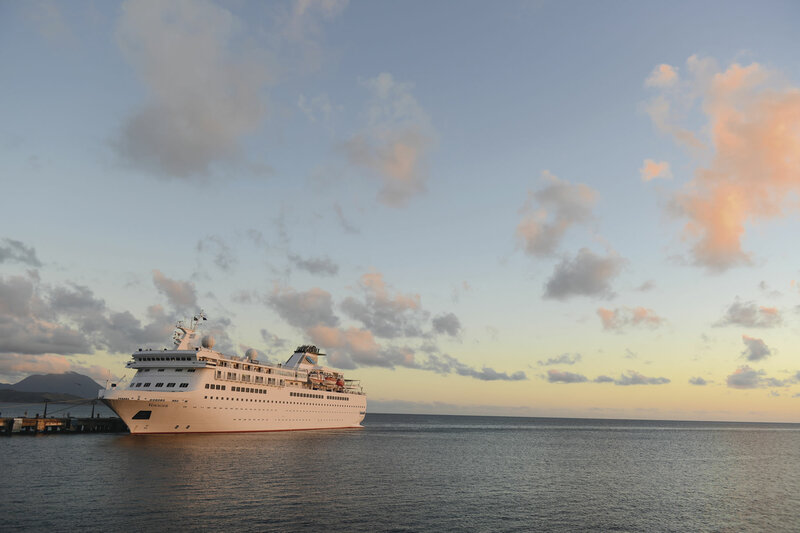 It was not only her first Christmas away from her family, it was also her first cruise. As you can see, she enjoyed it. And it was, without doubt, a wonderful family experience shared with 500 or so other passengers and the 240 crew. The countries we visited might not have been in Africa, but they were among those that don’t know about Christmas, according to Bob Geldof and his pals. That idea was blown straight out of the water before we left Colombo airport in Sri Lanka, where a pot-bellied Santa and his backing band welcomed us while advertising duty-free goods at the same time. It was, though, a fortnight of visiting temples of various kinds – Sikh, and Buddhist – during our visits to India, Myanmar, Thailand and Malaysia. There was surprisingly little in the way of tinsel and baubles on board Voyager – although the lounge did contain the biggest gingerbread house I have ever seen outside of The Great British Bake Off. And it was a novelty to be partying out on the pool deck late into the nights of Christmas Day and New Year’s Eve, when even Mrs H was persuaded to join a long conga line – although the presence of a certain assistant cruise director may well have played a part in that decision. Christmas Eve was also enlivened by a search for hidden Santas concealed around the ship – briefly interrupted for an announcement requesting passengers not to remove them once found; a carol service before dinner and a Christmas Spectacular variety show afterwards. This segued straight into a Midnight Mass attended by almost everyone on board. On the day itself, we all slept in before making our way down for a leisurely breakfast of Prosecco and scrambled eggs. Then it was time to collect another couple of bottles as we returned to our suite to open presents. While the oldies relaxed, the young ‘uns went off on a treasure hunt , which won them yet another bottle of fizz. No surprise then, that the Christmas morning service and the reindeer racing passed by in a bit of a blur, though we were alert enough to enjoy the pre-dinner entertainment – a competitive battle of Call My Bluff between the officers, led by Captain Neil Broomhall, and the entertainers. In the confines of Voyager’s sumptuous dining room, Christmas dinner was as convivial as at any country house hotel. The difference came later with that deck party in the middle of the Bay of Bengal extending the day went on way past midnight. Boxing Day was another full day at sea, time to relax and recover before three frenetic days seeing what Yangon had to offer. Unlike larger ships, which have to use the commercial port downriver, Voyager was berthed within walking distance of downtown and it was perfectly possible to stroll ashore. There is no doubt that Yangon is seeing big changes now the stranglehold of an oppressive military government has been eased. A few hotels are being developed – although there is still little which meets expected Western standards. There are mobile phones and even ATMs, unheard of when I was first in the country just 12 months earlier. But there is a long way to go. Many of the buildings in central Yangon dates back to colonial days and come closer to crumbling away every day. Street food cafes fill almost every yard of pavement in some streets – the furniture little more than child-sized plastic patio chairs and tables. The people are warm and welcoming – nowhere more so than at the Shwedagon Pagoda – and it was a wrench to tear ourselves away to head for the next port of call. On to Phuket and the New Year’s Eve party, followed by a climb to the top of Penang Hill on New Year’s Day. For Christmas 2014, the family will be together at home again – but we can’t wait for another Cruisemas. With the complete support of Number One Son.